Carrot and Radish Pickles (Do Chua) are staple Vietnamese condiments and this refrigerator pickle recipe is so easy. 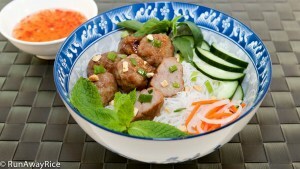 This dynamic duo accompanies every Vietnamese rice plate and banh mi/baguette sandwich. I have a really simple recipe and vary the size of the vegetables depending on how I plan to serve them. This recipe uses matchstick or julienned carrots and Daikon radish. To save time, I buy matchstick carrots at my grocery store (less prepping for me) and then cut the radish to size. You can also use this recipe to make a carrots only version. 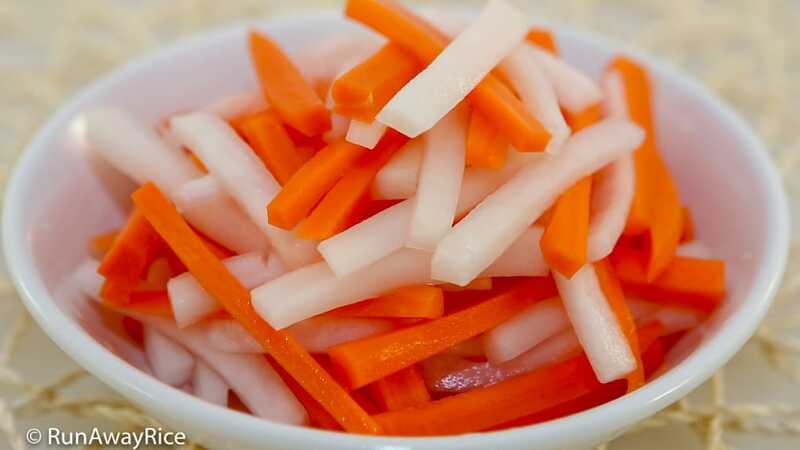 The carrots in this type of pickle are finely shredded (using a mandoline) and added to a dipping sauce for spring rolls or fish sauce dipping sauce. I usually make 3 different variations (as shown in my video) and keep them ready. Enjoy the Carrot and Radish Pickles shortly after making or let them marinate a few days for even more tartness. A quick tip, Daikon radish develops a strong aroma after pickling. Be sure to store the pickles in an air-tight jar or container. Combine the carrots and radish in a small bowl. Fill a medium glass jar with the vegetable medley. In a small bowl, combine the water, vinegar, sugar and salt. Stir until the sugar is dissolved. Pour the liquid over the vegetables filling the jar. Use a spoon to immerse the vegetables in the liquid. Cover and let the veggies marinate in the refrigerator for at least one hour. Serve the Carrot and Radish Pickles with sandwiches, rice plates or salads. Store the pickles in the refrigerator for up to a month. I am really impressed with this recipe. thank you!!! Love carrot and radishes when they are pickled! This is a great recipe. Can’t wait to make it at home! Thanks for the recipe! Greatly appreciate your clear and detailed instructions. I was hoping that you could tell me how to get rid of the stinky smell from daikon. I love pickled daikon but cannot stand the smell. Guess, I’ll just stick with pickled carrots. Lol! Do you mean how to keep the smell from permeating your refrigerator when storing it? If so, store the pickles in a glass jar (not plastic) and seal it well. I cover the mouth of the jar with a double layer of plastic wrap and then seal tightly with the lid to prevent any smell from seeping out. Daikon white radish is the common but try other types of radish as well. They can be less pungent. To get rid of the general smell in your kitchen, I use scented candles, something fruity and sweet smelly. Hope that helps! 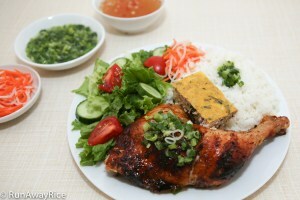 How come do Chua is so stinky at home but when you go to banh mi stores you can’t smell it? Do they do something special to get rid of the smell? When I make it, the jar seems to smell up the whole fridge and when I take it out to eat it, it smells up the whole kitchen. Will this also happen when I make this recipe? Yes, these pickles have a strong aroma. I find that if you use well-sealed glass jars, the smell will not pervade your refrigerator. (Do not use plastic disposal food containers. They are not air-tight.) I don’t know if the banh mi stores do anything special but I can’t imagine it would be good for you. Perhaps at the stores, there are so many other sweet smelling foods like baking bread and cakes around that you don’t notice the pickles. Good Luck with the recipe. Let me know how it turns out for you! I was wondering how long can it be stored? I’m planning on making a big batch. The pickles are good for up to 1 month in the refrigerator. Enjoy!